This clear plastic stand makes it appear as though the system is floating above Link, almost like he just acquired this item. You can hear that music right now, huh? The fancy part is the USB cable, which clamps onto the Switch. It features a Triforce that illuminates when plugged in. When not in use, Link holds the USB cable. I haven’t done a Jurassic Park design in a long time, so how about this…boring desk? I’ll clear up the confusion shortly, but first let me start off by saying that I was inspired by this neat Millennium Falcon Theater. In that setup a tablet device is elevated, allowing users to lie underneath it and watch movies. This is a geeky easel for parking your tablet on your desk. 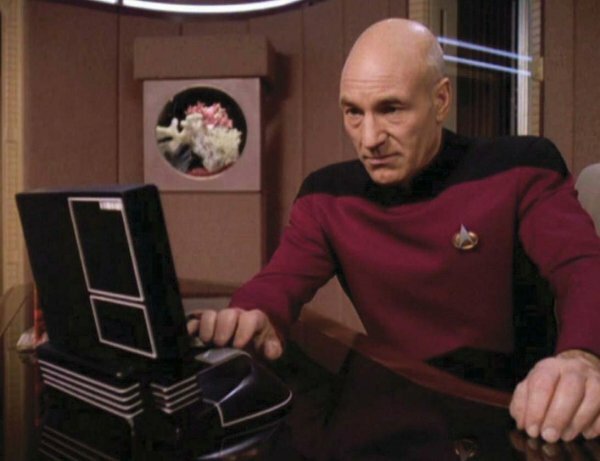 The design is based on Picard’s computer from his ready room in the TNG series. The tandem of the tablet and easel makes it appear like a functioning Star Trek computer (which was also touchscreen on the show). This prop would be a great addition for geeks who refer to their workspace as a “ready room”. It features an adjustable backboard (to tilt your tablet) and a Lazy Susan to swivel it in place. You could go a step further and make it a charging dock as well. The front section could also provide some storage space (for office stationary). If you want to be really fancy a fake back-lit screen could be included in the easel for when there is no tablet in place. If you like this please check out some other fun Star Trek designs.